I don't listen to or watch the news anymore; it's too depressing. An upbeat story: scientists have discovered that lisping is genetic, not psychological. If you lisp, this is definitely good news, but I get my kicks in other ways. Going to museums and galleries is my pick-me-up of choice. The current show at the Guggenheim Museum, "Contemplating The Void," is a buoyant moment. Unlike most museum shows, which we think of as rarefied events, this show is hung unframed, each work just pinned to the walls (with a few fragile exceptions). Organized by Nancy Spector, Deputy Director and Chief Curator, and David van der Leer, Assistant Curator for Architecture and Design, the exhibition will feature renderings of these visionary projects in a salon-style installation that will emphasize the rich and diverse range of the proposals received." and some even a little laughter. Floating rope bridges connecting the ramps. and attaching red and gold decals to all the surfaces. How about thousands of balls bouncing down the ramp? like a pot on a saucepan. OR turning the entire building into a giant camera obscura? And for a real pick-me-up: The Gugg as a container: a cup of macchiato. If you are feeling a little down, and find yourself in New York City, visit "Contemplating The Void," I believe you will find it has restorative powers. The Guggenheim will be conducting a live auction of work in the show on March 4. Curator David van der Leer led a small group of us on a private tour of the show. He is Dutch, which I only mention, because in my limited experience, Dutch people seem to be very open and extremely engaging. Maybe that comes from living in a small, crowded country. 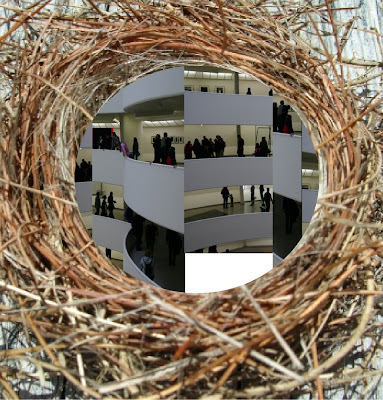 Most importantly, he brings a much needed new perspective to the Guggenheim. I look forward to seasons of interesting shows at the museum.